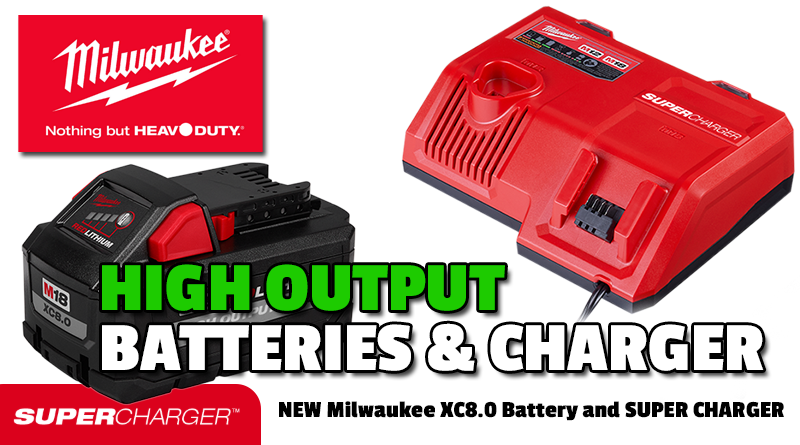 Once again Milwaukee has taken a huge leap beyond the competition with the introduction of two new High Output batteries and Super Charger. For quite some time the battery game within the cordless tool world has been purely a basic Amp Hour race. Starting with 1.5Ah and finally ending up at the peak with 6.0Ah packs. These were all basic lithium-ion battery backs using 18650 cells. These cells have the ability to hold a limited amount of power so all manufacturers were playing within the same arena. The big change is switching to slightly larger lithium ion cells which allows for greater capacity with minimal physical size increase. Most companies such as Bosch and Dewalt have gone with 20700 cells in their upgraded packs. These cells offer a good bump in performance over the 18650 cells which all packs used to use. But Milwaukee has taken it a step further and used even larger 21700 cells. Once again at a slight increase in physical size they have bumped performance to a new level. The above image shows the difference in the cells we’ve discussed. The above graphic shows the 4 newest battery packs from Milwaukee Tool which uses the larger 21700 cells. The XC6.0 and HD12.0 have been out for some time now but the XC8.0 and CP3.0 are both new. The CP3.0 is due to start shipping in April and the XC8.0 pack is reported to start shipping in mid May. Let’s Take a Closer Look at the Two Newest Packs. The 48-11-1880 XC8.0 M18 Battery From Milwaukee. Milwaukee’s newest High Output battery isn’t uniquely special in their lineup when it comes to large capacity. They also have the current HD9.0Ah and the monster HD12.0Ah. Although we do feel this XC8.0 might be the sweat spot between size and performance when it comes to this new category of large packs. Going larger with the HD12.0 makes for a pack mainly suitable for very high draw tools which need such a large fuel tank. Something like a SDS-Max rotary hammer comes to mind. Or on something stationary like a table or miter saw. But on a circular saw or reciprocating saw which gets handheld use, users may suffer from more fatigue with a heavier pack. For those uses a user will likely decide on less weight and choose a standard pack or maybe the new XC6.0 pack. But if they need a bump up beyond those smaller options it’s nice to know they can always slide on one of these large capacity batteries. The 48-11-1880 is set to start shipping to dealers in mid May. The 48-11-1835 CP3.0 M18 Battery From Milwaukee. The next new battery announced by Milwaukee is the 48-11-1835 CP3.0 pack. This battery could be a game charger when it comes to standard drills and impacts or similar tools. On drills and impacts most users do not need the added capacity of a 4.0Ah, 5.0Ah or 6.0Ah pack. Yes its nice to have the added reserve and maybe necessary for some users in precarious positions where a dead battery could be a huge inconvenience. But for standard usage old “fat” 3.0Ah packs provided all day use in a drill or impact. Now factor in having the same size fuel tank in the new CP3.0 pack but in a package slightly larger than the old slim 1.5Ah and 2.0Ah pack sizes. Here at Tool Report we feel this trend towards higher capacity slim packs such as this new CP3.0 and the Bosch GBA18V40 4.0Ah CORE pack are the future for any use in lower power demand tools. With reducing user fatigue becoming such a driver these days the high output slim packs will surely see a boost in popularity. Whats Up With The New SUPER CHARGER? The magic to the sauce Milwaukee is cooking with is their new SUPER CHARGER. The new model 48-59-1811 SUPER CHARGER is capable of detecting if you have a High Output battery and can charge the battery at a much faster rate. The new SUPER CHARGER is “optimized” for these new High Output packs and is designed specifically to charge without causing damage which can sometimes be associated with charging a pack at too rapid a rate. Now with this new SUPER CHARGER there may be some confusion on chargers within the M18 platform. The below chart should hopefully simplify the lineup. The progression is simply [STANDARD CHARGER] >[RAPID CHARGER]>[SUPER CHARGER]. Another note to mention is Milwaukees new logical thought process on their M12 and M18 battery lineups. The breakup their batteries into three main categories. CP : These pack stand for “Compact”. At 2.0Ah they have plenty of power for 1/4″ impacts, drills, multi-tools, and many other tools where size and weight are more important than run-time. I know when using an impact or drill I usually grab a slim pack rather than a fat pack. Of course being up on a scissor lift or similar I will grab a large pack for the ultimate run time. But for everyday building and construction I find a slim pack perfectly suitable and preferred. XC : This category is the largest ranging from 3.0Ah all the way to the new XC8.0 pack. These “Extended Capacity” packs are great for drills and impacts where longer run-time is needed. Or tools such as circular and reciprocating saws which draw down batteries much quicker. HD : The top of the Milwaukee M18 battery spectrum is the “High Demand” packs. These mega giants are good for one thing, RUN-TIME. Think of it as having an extended fuel tank on your work truck. This can mean getting crazy long run time on average draw tools. Or it can mean opening categories into tools which were not an option before these packs existed. Like say large diameter grinders, table saws, SDS-Max rotary hammers, etc. As of right now Milwaukee is only listing these new items as “Coming Soon”. We reached out to a local industrial Milwaukee dealer and they say the XC8.0 battery is showing mid May for shipping, April for the CP3.0 battery and Early July for the Super Charger. With the addition of these 2 new battery packs it brings the total number of M18 packs to 11. While it is great to have so much choice available to the consumer it also can cause a bit of confusion. Especially when it come to buying kits. From the standpoint of one of the Milwaukee dealers we spoke to about this they mentioned its becoming a challenge to stock the correct kits for their customers. Some will want compact battery kits. Others will want the standard batteries and others will want the large HD packs. To further the complexity there are even single and double battery kits. Too much choice if often a bad thing and I fear Milwaukee way be going down that road right now. The Full M18 Battery Lineup.